opening their heart, mind and wallet to your business. No one else on this planet has your unique story — and it’s that story that will attract your audience, set you apart from the industry, and create your legacy. This April I’ll teach you how to tell it (and sell it) — for $0.00. 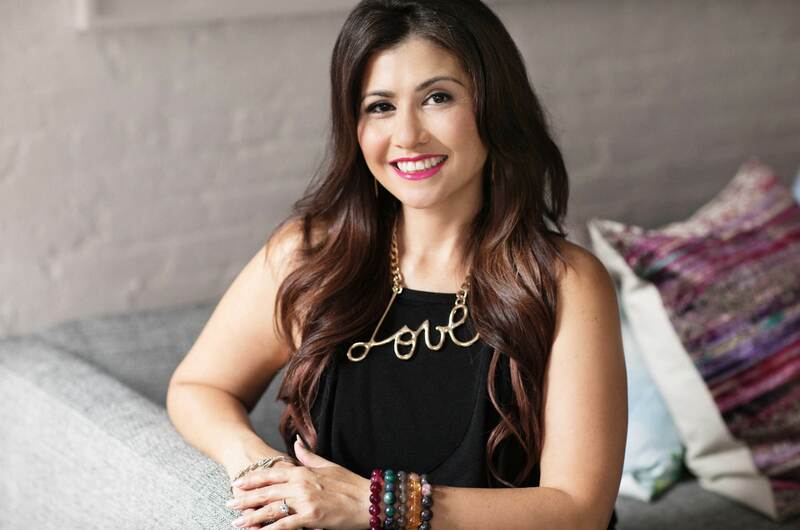 Craft the story that will bridge the gap and build a relationship between you and your ideal customers that will take your business to the next level of impact, influence, and income. 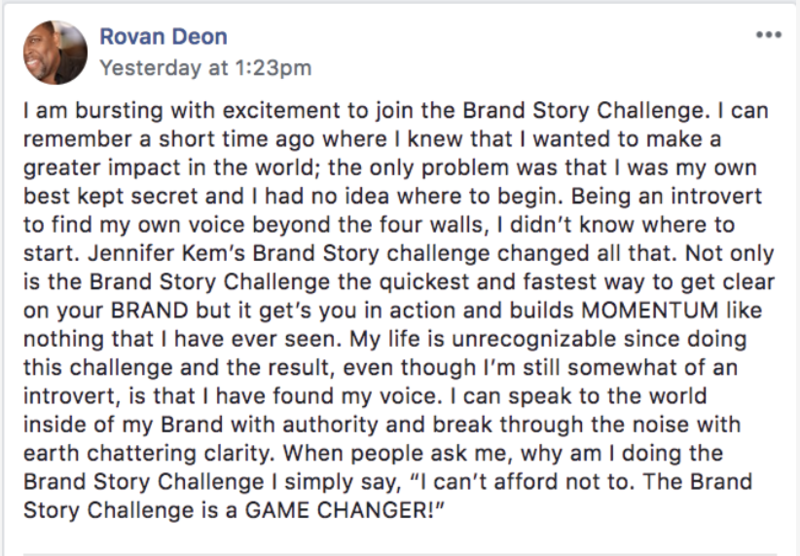 What is the Brand Story Challenge? Your story = Your businesses unique advantage. It’s the core message that attracts the right clients. The Brand Story Challenge is a 7-day challenge that will help identify and use defining moments of your life to position you and your brand as the clear choice for helping your audience solve their problems. And let’s be clear, the Brand Story Challenge is not a static experience. This isn’t an “add water and mix for results” type of deal. This is a dynamic experience – one that will lead you on the journey to crafting the brand story that communicates exactly why your dream client should pick your business instead of the competition. Here you’ll learn what stories to tell and how to tell it. And at the end of it all, you’ll have created the strategic story that will speak directly to the deepest need of your ideal client, earning their attention and wallet share. Are you satisfied with your less than stellar marketing results? Hi, I’m Jen Kem—Master Storyteller. There’s a common thread I can trace throughout my journey—from starting out as a junior copywriter at the biggest advertising agency in the world to my position as Regional VP of Marketing for Verizon Wireless, to building an 8-figure brand underwear company (and 3 more businesses that make a combined revenue of $25,000,000 annually)—and that thread is the story. I’ve worked with (and been) the best in my industry for my market and it wasn’t because the products or services I was selling was that different from our competitors. It was because we developed our story and used it to speak to the heart of our ideal clients. The products and services were good, but it was our story that made them into raving fans and paying customers. Their story sold their brand. 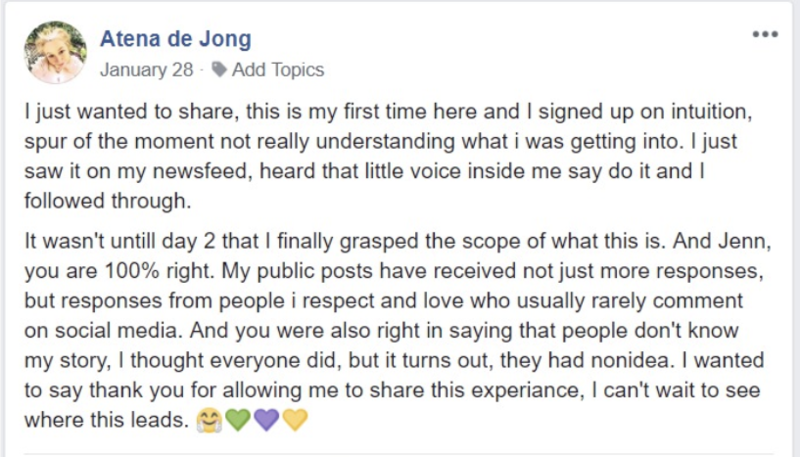 Yet, I’ve watched for years as brilliant executives, leaders, artists, founders, and owners like you fail because they simply aren’t telling the right stories, at the right time, to the right audience. Their “story” sounds like everyone else. Or it doesn’t reach the right people. Or it doesn’t create a relationship. Or it doesn’t inspire action. This disconnect has made them leave impact, influence, and income on the table. Markets are left, untapped. Buyers lose interest. Communities don’t grow, and people (who need them so badly!) are left, unserved. But, starting Sunday, April 28th, you have the opportunity to change that. 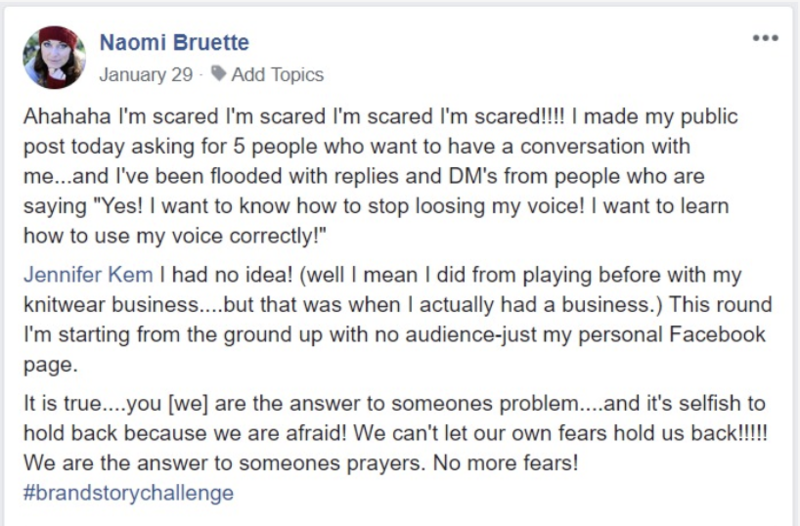 This 7-day challenge has helped more than 11,000 business owners, from newbies with a day job to 8-figure earners, craft the unique brand story that has successfully distinguished them from the competition and create a magnetic attraction to their audience. AND, if you participate full out* each day, you’ll be entered in to win FREE tickets to my upcoming conference for business owners in October. Why you? What is the core of your story? Do you remember the moment you felt called to start your business? Let’s explore what happened — and what happened next. What was the moment you decided to build your business and go after your dream? What Do You Do Really? You provide a product or a service — but what do you really do? Who is your audience — inside and out? What do they need and want most from you? What will your brand represent? How do you want to make people feel? How will you turn your story into action steps? What do you want people to do NEXT after they meet you? You’ll have an authentic, inspiring, captivating, powerful story that will attract clients like bees to honey, making it absolutely clear that your business is the perfect choice for your audience to solve their problems. The story you craft can be used all over your social media, email campaigns, speaking opportunities, Facebook ads, livestreams, and media appearances, creating greater authority + influence for your business and ultimately making more sales (with less effort). 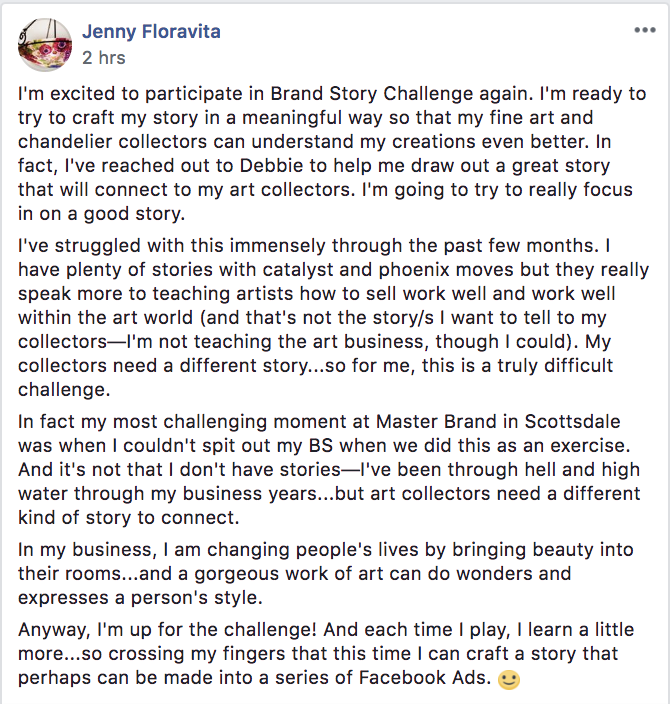 Important: Please, ONLY join the Brand Story Challenge if you’re committed to your businesses growth and the power of your businesses unique story. Crafting a brand story is both art AND science, and this is not a “just add water” challenge. You will be challenged to dig deep to discover the brand story that has the power to elevate how easily your business attracts clients. Your brand has a story that will create massive impact + income. Only you can uncover it. Your brand has a story that will create massive impact + income. Only you can uncover it.